The Town Belt adjacent to the Berhampore golf links forms part of the city to sea walkway. The re-vegetation of this area has been a high priority for the Wellington City Council and much progress has been made. 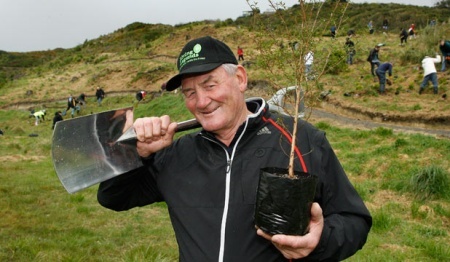 With the help of Rugby Legend Sir Brian Lochore and local volunteers, Living Legends has been delighted to be able to extend this work to the tune of 11,000 native plants in the ground. 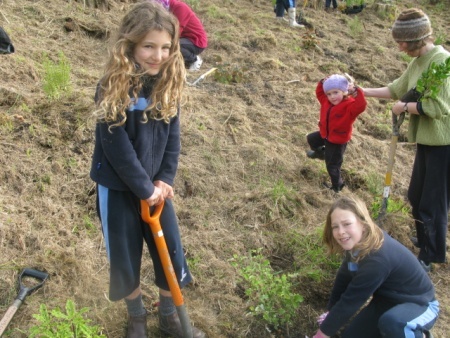 Maintenance of these plantings has now been handed over to the Wellington City Council. Wellington/Wairarapa’s Rugby Legend Brian Lochore first played rugby in the Wairarapa primary school reps (after a trial match in which he does not remember once touching the ball! ), and then the Wairarapa College 1st XV in 1956, under the coaching of 1949 Black reserve Gordon Henderson. He played his first season of both senior and representative rugby in 1959, with an appearance for Wairarapa-Bush against the Lions. His play in that match caused critic T P McLean to identify Brian as one of the most promising forwards the Lions encountered on tour. All Black trials in 1961 and 1963 followed, before being a reserve for the one-off test against England. Brian made his All Black debut on the 1963/64 tour to the United Kingdom. Brian was recalled for the All Blacks for the 1965 series against South Africa and became an All Black fixture until he retired with 68 caps from international play after the 1970 tour to South Africa. Brian was appointed All Black captain in 1966, and he proved to be one of New Zealand’s most successful captains, with just three losses in 18 tests. Brian’s proudest rugby achievement was captaining New Zealand during the unbeaten 1967 UK tour. As a coach Brian was just as successful. Brian became the Wairarapa-Bush coach in 1980 and took them to First Division status within two seasons. He was appointed a New Zealand selector, and in 1983 became the national coach. Spectacular achievements include taking out of the 1987 inaugural World Cup and the 1986 ‘Baby-Blacks’ victory over France. Following his time with the All Blacks Brian has been busy with local and international assignments. Brian coached the Overseas Unions at the IRB centenary 1986, he was the All Black campaign manager at the 1995 World Cup, assisted with the NZRFU’s player negotiations when rugby went professional in 1995 and led the Rugby Union committee which was set up to improve the NPC. Brian, who confesses “I would have trouble with my conscience if I didn’t help when I was asked to” has seldom, if ever, looked for a job, he has responded to requests for help. That help has included such major exercises as serving on the Hillary Commission (becoming chairman in 1999) and the Sports Foundation. Honoured with the OBE, Sir Brian was knighted in 1999. These days Brian is focused on farming and is busy supporting his family who are heavily involved in rugby as well. His son played and now coaches and his grandsons also play the game.